Selling off a DR650 today that hit some problems, and isn't worth the time. 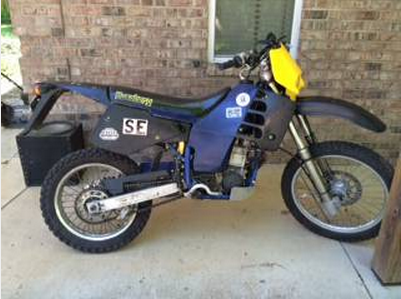 The guy i'm parting some stuff out to has a '97 Husaberg FE501 Dualsport he's wanting to sell since he's moving. of course, i'm interested- i've heard some great stuff about Husys, and I want something comparable to the DR650 in weight / power. I ride a KLR650 as a tourer / commuter, so you can imagine my want of a lighter, "fun" machine. Of course, this thing has a few issues. Trip meter isn't working, the left fork seal is leaking, no kickstand, and broken muffler flange. He's wanting to let it go to me for 1,100 with trades. How easy is it to find parts for an older bike like this? What's some common failure points on this model? Would it be able to handle highways OK? Any other data you guys would like to throw in would help, too! Last edited by Mongoose; May 15th, 2014 at 02:29 PM. Parts are getting harder to find but they are still out there, plenty of guys on here that can help find, supply, upgrade or retro-fit what you may need. Cant say what are common failures for that particular model but my older bikes have both had waterpump/ seal issues and bottom end bearing issues. Once fixed they have been good to go since! None of my bergs are really very "happy" on the highway. It's not that they wont do it, just that they like short hard acceleration and struggle a little with constant sustained revs for long periods. They just want to go faster all the time! Im sure others on here with motards can give better advice about that aspect as my bikes don't see the open road often! Reliability will come with good maintenance. If the bike is sorted out well and you keep the oils and filters fresh, use decent fuel, etc, it should be very reliable. Bare in mind these things are quite different to the DRs and KLRs you are used to! Much lighter, better handling, better power to weight, more revs but with this comes more maintenance, etc. I would say go for it and enjoy! Use it as a fast toy on the trails and rely on your KLR for the mundane highway duties!